Liberals live life with their glass half empty resenting others who live with their glass half full. 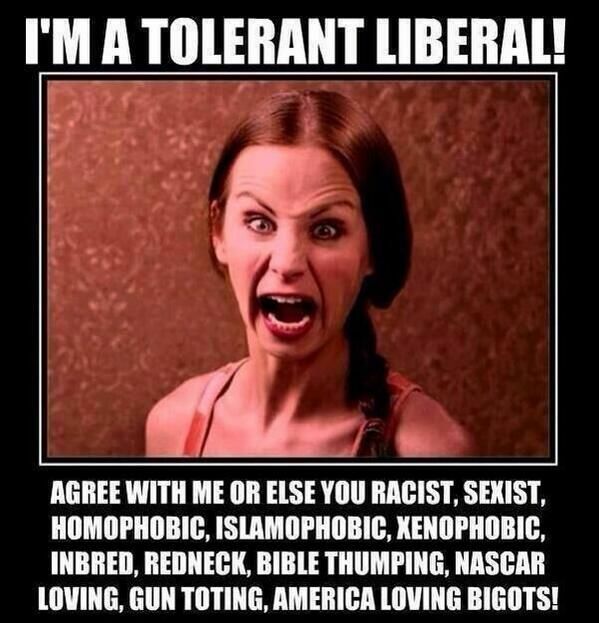 Leftists spew their hate in various ways; from Antifa Nazi fascists declaring all Republicans are the KKK so they can justify attacking good people at rallies in support of President Trump upholding American laws, to liberal professors spewing their hate on Texas declaring the people deserve to suffer for voting Trump into office, to Follywood actors declaring their love and support of sociopathic racists, to corrupt Democrat politicians trying to guilt trip Trump into allowing illegals to vote. It’s a sickness born of hate, greed, and envy with a hefty dose of ignorance, delusion, and corruption thrown in. What you have never seen is conservative Christians assaulting Obama supporters in ten years of his dictatorial rule. What you have never heard is a conservative saying New Jersey deserved to be devastated by Superstorm Sandy for voting for Obama. What you never hear is any Republican say David Duke should run for president. And what you will never have is any Republican promoting criminals and welfare slavery in America. Leftists feed on corruption, lies, deception, and ignorance. Take this fool of a professor – a college professor! Decent human beings know you do not blame the victim for their suffering caused by the likes of bullies, thieves, and rapists, let alone caused by Mother Nature. How childish and contemptible! What makes it worse is that this is supposedly a learned man who is teaching our children what kind of adults to become! This is why liberals should never be permitted to be teachers. They do not educate, they indoctrinate into their ideology of hate. What is even more stupid is that he is damning the people of Houston when cities tend to be Democrat due to being far more corrupt than the suburbs or rural regions. But like all liberals they feed off of the suffering of the people. Only a liberal would see profit in the ill fortune of others and the two-faced media only makes it worse. In 2005 they smeared Bush for not immediately landing in ravaged Louisiana. In 2012 they lauded Obama for doing the same in New Jersey. And now in 2017 they curse Trump as they cursed Bush. It’s not hypocrisy, it’s just how evil minds work. After the hurricane disasters of 2004-2005, Al Gore decided to profit off of fear-mongering producing his Chicken Little epic, “An Inconvenient Truth,” in which he and his global warming scientists predicted the United States would be devastated by major hurricanes repeatedly every year for decades to come. (This hurricane is the first major hurricane to make landfall in twelve years!) He also predicted that the North Pole would be forever devoid of ice by 2013. Have the dupes of the world yet gotten a clue? Leftists come up with these ridiculous analogies to prove that their junk science has real dangers like man’s CO2 pollution will kill the planet. They say, ‘try sitting in your garage with the car running and the door closed and see if you survive.’ Ok, if you think water is so good for you try filling the sink and sticking your face in it for five minutes. How stupid! Another suggested that the Earth has all the CO2 in the atmosphere it can contain without being a danger to life. His analogy was of a bathtub that is 100% full of water and adding another 4% to see what happens. This is the very same analogy they have been using for last hundred years about why there are too many humans on the planet and that overpopulation will cause massive starvation. Newsflash! Mankind does not create more carbon on the surface of the planet. All we can do is circulate it into the atmosphere and then the Earth itself recirculates it back to the surface through rain. What goes up must come down is so simple a child could understand it – unless that child grows up to be a liberal. Why do you think all these animals can breath and the Earth doesn’t become flooded with CO2? What their junk scientists do not attempt to do is show any evidence that any of the gases they say man is putting into the atmosphere to cause climate change even exists because they do not. The Earth cleans itself. All they can show is that man is producing them. But their audience has no clue how the science of climatology, meteorology, or Earth sciences even begin to work. They have no clue how the planet circulates the atmosphere or the waters and keeps itself clean and the ecosystem in balance. Believing mankind can affect change of the planet is believing that fire ants can alter the environment of a field. All the ants can do is make little dirt piles that eventually get washed away. The things in which liberals believe, who call conservatives “flat-earthers” for rejecting their junk science, can be found in the superstitious blatherings of Dark Age pagans. Democrats are the party of hate, division, and ignorance. They have convinced the descendants of their former slaves to become slaves once again, and they are trying to convince free youngsters that totalitarian socialism will give them more freedom. They want illegals to supplant the black voters who are being educated to the Democrat’s schemes because they need a permanent underclass to deceive into voluntarily being dependent on them. Everything for which the Democrat Party works is designed to cheat the people into giving up their rights, their wealth, and their futures to serve the elites of the party on the promise of sharing the wealth. In a hundred years Democrats have not shared the wealth, but they have done a great job of sucking it up for themselves and blaming Republicans as their scapegoats, which their RINO allies willingly do for their piece of the action. This lie needs to be exposed to the general public and the lying Democrat media struck down rather than allowing them to strike down those who speak the truth! I am WHITE MAN! HEAR me ROAR – TRUTH to POWER! This entry was posted in Politics and tagged Antifa, Captain America, Chris Evans, Democrats, Democrats love crises, Hurricane Harvey, Leftist corruption, Liberal hate, Liberalism, Media propaganda, Professor says Texas deserves Harvey, Racism, Schumer wants illegals to vote, Texas Floods. Bookmark the permalink. I’ve never yet met a CC believer who could answer the question, “how much CO2 is in the atmosphere?” Answer: approx. 400 parts per million of which about 6% is man made. I’ve also heard the argument about sitting in your garage with the engine running. What these spaghetti brains fail to realize is that it’s the CO that kills you, not the CO2.